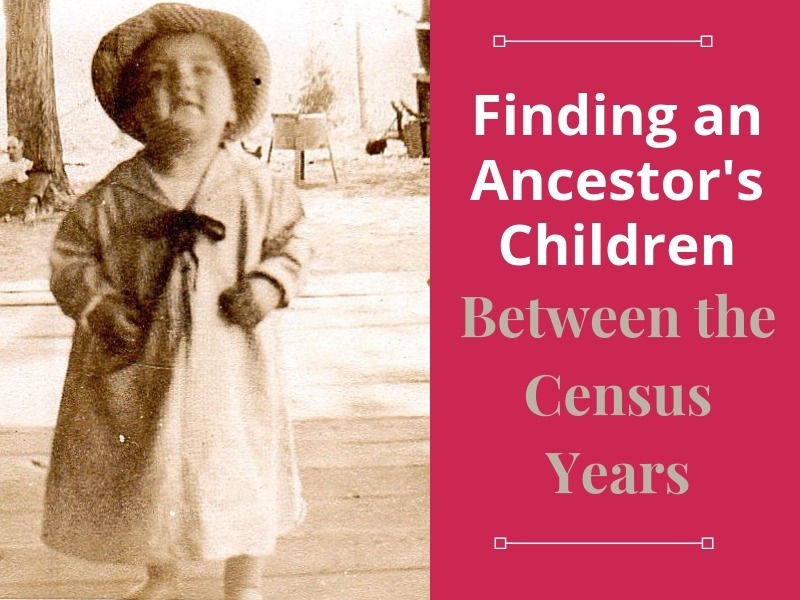 Finding Children Between the Census Years | Are You My Cousin? Your family tree is full of couples with their children listed underneath. They make up a nice complete family group. Are you SURE you have found the whole family group? Let’s clarify that family group a bit more. Your ancestor’s family group is made up of the husband and wife and their known children. Unfortunately the infant and child mortality was high in the years of our ancestors. Visit any older cemetery and you find many infants and children did not survive past childhood. Children themselves in the 1800’s and earlier did not generate many records. If a child’s entire life span fell between two census years, the researcher must think “outside of the box” to find a child’s existence and name. 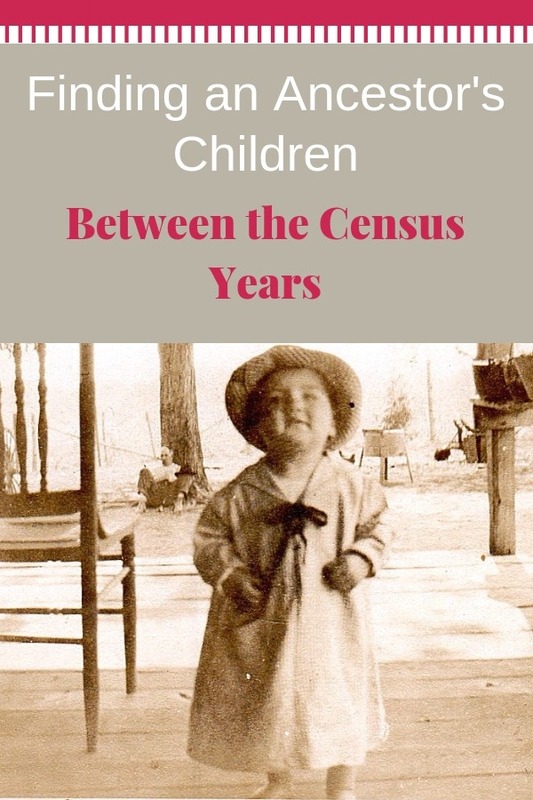 Finding Children Between the Census Years – It is Possible! Family Bibles are often the only source of a child’s existence. 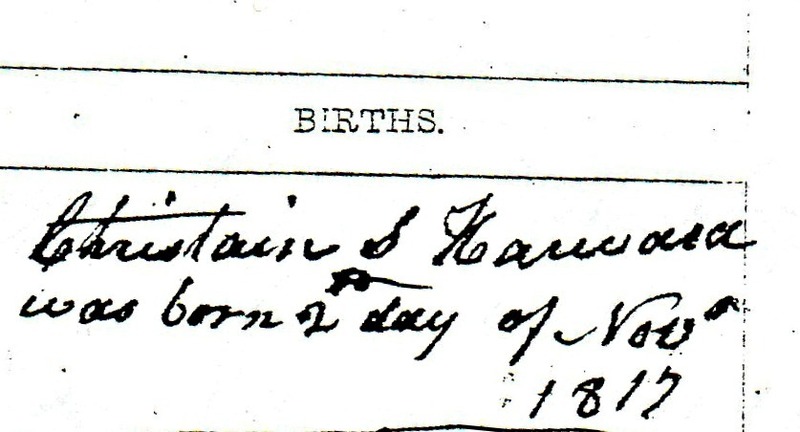 This example is taken from the Harward (Howard) family of Moore/Lee County, NC. Not sure if a family Bible exists for your ancestor’s family? Check with other relatives, collateral relatives, collateral genealogy researchers, local archives and museums and the state archives. For example, the North Carolina Digital Collection has 1500 Bible records online. Also, check historical societies and even keep an eye out on eBay. With sites such as FindAGrave and CemeteryCensus.com, researching the cemetery where your ancestors are buried is possible right from your home. Be sure and check back periodically for updates to their databases. Gravestones are another source of information on an ancestor’s children who died young. This example is from the Maddox family of Chatham County, NC. 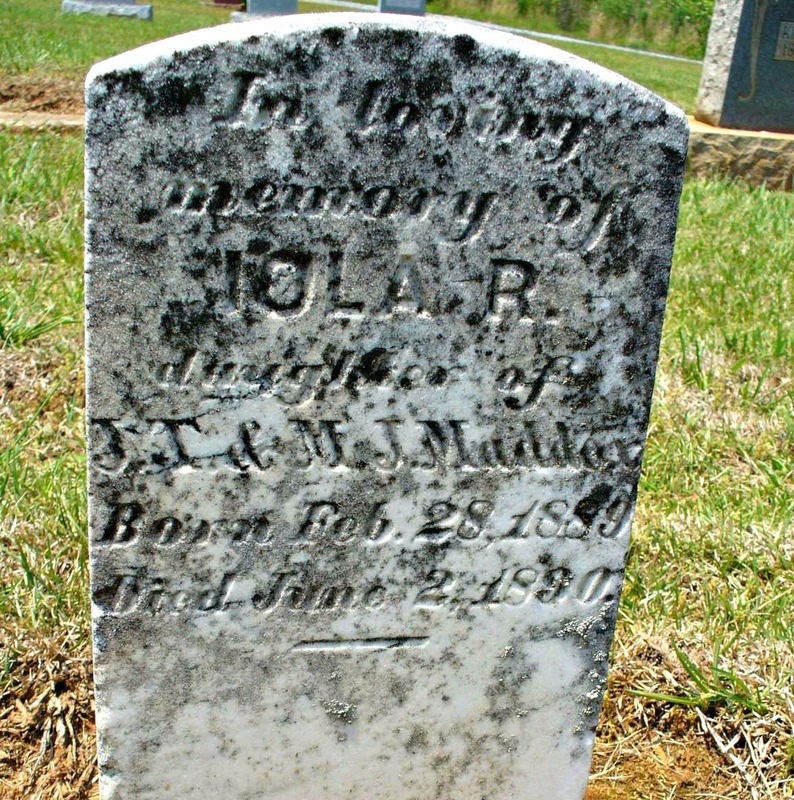 Viola Maddox was born 28 Feb 1889 and died on 2 Jun 1890 at the age of 15 months. With the absence of the 1890 census and no known family Bible existing, this is the only record found for Viola’s short life. Tip: Take a close look at the cemetery where your ancestors are buried. The 1900 census record records “Mother of how many children” and “Number of these children living”. The 1910 census record records “children born” and “children living”. Comparing a woman’s known children with the actual number of children she birthed will provide clues to previously unknown children. The 1910 census also asks if the individual was “blind in both eyes” or “deaf and dumb”. [Note: Though not acceptable today, these are the phrases used on the census at that time.]. Learning an ancestor’s child had a disability can point you to records for their care such as special schools or asylums/institutions. 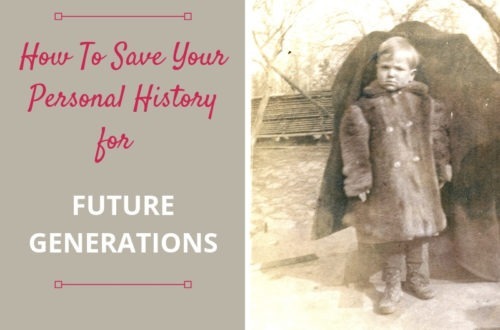 Tip: Ask your family members about children of earlier generations who died young. Don’t forget to ask the relatives of collateral ancestors! Why is it important to find ALL of your ancestor’s children? Finding these children that lived between census years will not progress your family line back further. It WILL tell these children’s brief story and the story of loss your ancestors endured. Now back to our original question…. Are you sure you have found all of a couple’s children? What Is That Family Cemetery REALLY Telling You? Another great way is to read old newspapers. I have been doing obituary extractions for the time period 1900-1910 as a volunteer project in a local library, and I am amazed to see how many infants and children died during this time period. I’m sure the same is true of earlier time periods also. The frustration to me is that so many times the newspaper only reported “4 month old son of John Doe” instead of giving the child his or her name. Janice, You bring up another excellent source of information for these children. Thank you! I love the name of your blog! I have been researching a long time. If your family has cemetery plots, get in touch with the caretaker. I thought we had an empty grave but it was the 1st child of my great grandparents that died at 6 months old. I never would’ve known. So check out the cemetery plots and talk to the caretakers. usually in old cemeteries, the records are passed through the generations of one family. Good point, Sue. I’ve found interesting information from sexton records, too. also, if you are researching relatives in other states, those states may have had the 5-year census. Iowa does and the 1925 census is 2 pages long so if you see it on Ancestry go to the next page. It will list the residents’ parents and when they were married, etc. I have verified children this way. Thanks for the reminder of those 5 year census records! Nancy, I’m so glad you found this helpful! Those blocks have helped me more than you will know. I wish it was asked on every one. I have found Civil War pension records, and possibly other military service pension records to be a good resource for gathering information on the children. Gail, That is another great source for finding an ancestor’s children. Thanks for sharing! Hello! Does this apply to records in England too, especially with illiterate families? I’m working on finding missing children from 1871 and forward. Sue, I’m not sure if it applies to English records, too. I have not done any “across the pond” research as of yet. I’ll put the question to my English counterparts. You are more than welcome, Gail! Yes, another great resource! Thanks for adding it! God bless Pennsylvania and other states who willingly open up their death records or other records. I found a 2 year old, born between census years, that we had no idea ever existed. She got into her parents’ medications and died of an overdose. Incredibly sad. We know the story, despite never being told of her existence. Very grateful. On FamilySearch I fill in the parents names and leave the rest of the search fields blank. Sometimes I use their first and last names and sometimes I use only their last names. I have found a number of “lost” children this way. That’s a really nice way to use those search fields! I hope I’ve given you the right email address. sometimes I use yahoo and sometimes gmail. my problem is finding my great great grandparents my great grandmother Mary Angeline Lawrence was born 25 May 1870 in taylorville Christian Illinois. The problem is I don’t know who her parents are! I’ve looked all over the place and can’t find them. I even contacted the county clerks office. HELP. 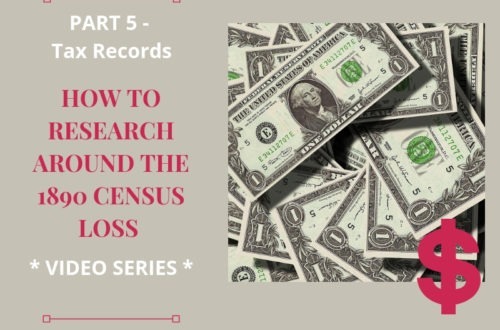 How To Research Around the 1890 Census Record Loss - Part 3: City Directories | Are You My Cousin? I live in Taylorville,il maybe I could help her. Could you give them my email and have them contact me. Yes, Ann, I can do that. Thank you for your generosity.